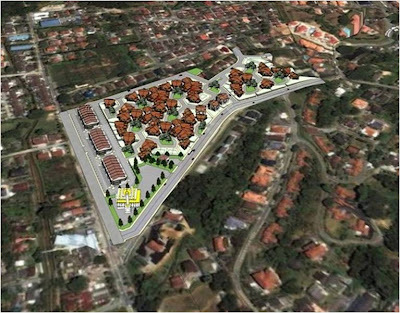 This is my project in Nong Chik Johor. It’s somewhat different from other housing schemes. It is a hillside development on 14 acres of land situated just at the edge of Johor Bahru Central Business District, which will offer a something like a traditional village lifestyle. Small groups of houses are laid out around a communal courtyard like friends sitting around a table. This makes it easy for neighbours to get to know each other. Strangers entering a cul-de-sac would feel that they were entering a semi-private area, and furthermore they would be easily recognized as strangers by the residents. It’s like that in the kampong, people know each other; it’s not uncommon to greet a stranger and to politely ask what brought him to the kampong. The loops and bends in the roads leading to the houses, less than 25 metre in any straight stretch, slow down cars to a walking speed - 15 kilometres per hour. Furthermore, with the Honeycomb layout, parents can easily oversee their children playing in the courtyard in front of each home. Indeed, there are many ‘eyes on the street’ that can deter unwanted behaviour. Giant, fast-growing trees will be planted in the courtyards to shade and cool the outdoors. All these factors will encourage parents to let their small children play outside. The courtyards not only serve as a recreational area, but are also suitable for weddings and any other community events. 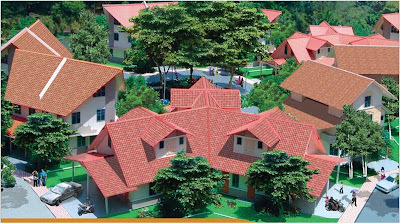 There are three new types of houses, the quadruplex, sextuplex and duplex house designs, which are nothing like the ubiquitous terrace houses, but nevertheless pack more units per acre. The houses designs will also feature thick roof insulation, generous overhangs and automated night-time ventilation that will reduce radically the need for air-cons. The hill-side houses will follow closely the existing site contours in a way that minimizes the construction of retaining walls. 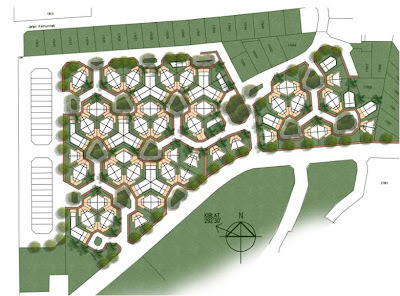 The Honeycomb housing can be said to be an attempt at recreating the Malaysian kampong. It seeks to offer a community lifestyle that many used to enjoy in their childhood, but in an urban setting. I saw it also as a cost effective alternative to terrace housing. 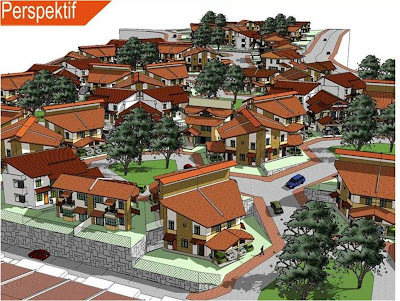 The pricing for this development, starting at RM295,000 for a 1400sf quadruplex house near the city confirms this. I think honeycomb housing is really a wonderful idea! Recently I moved to KL because of my husband's work. I am staying in a condo. I like KL but I am not used to the people here. I tried to be friendly to my neighbors but most people avoid eye contact.